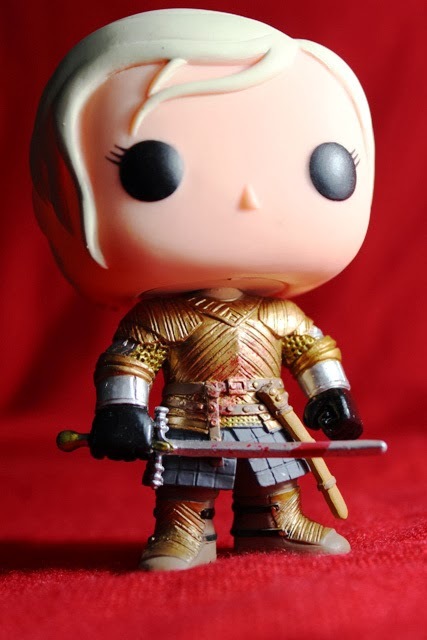 Talking Tiny Toys: Brienne of Tarth (Game of Thrones) Funko Pop! 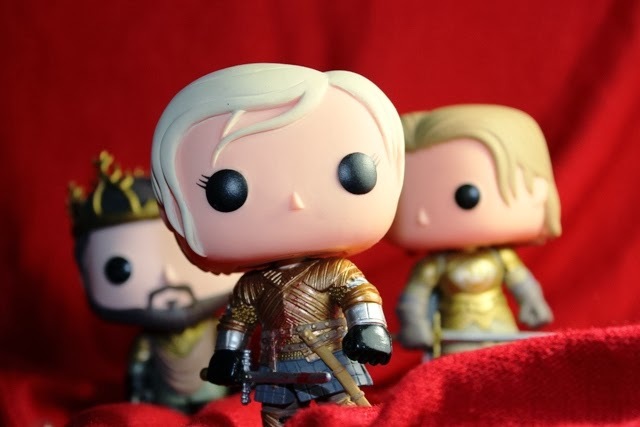 Series 3 of the Game of Thrones Funko Pop! Vinyl Figures are finally here and I can't help but be excited. I've been a fan of George RR Martin's fantasy books for over ten years and have followed the creation and subsequent success of the HBO series since its inception. I admit it, I'm obsessed and was thrilled when they started pumping out the merchandise. Lately, Funko has stepped up their game (and taken all my money). 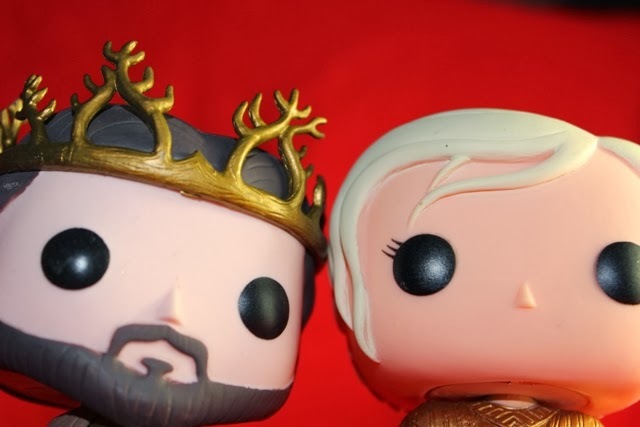 I love the minimalist designs of the Pop! line and while I question some of the character choices for series 3 (Still no Sansa? Really?) I couldn't wait to get my hands on them. 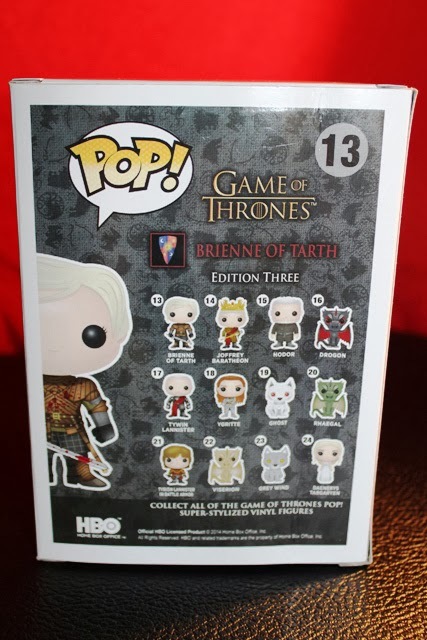 Hell, I own the Valyrian Steel Ice replica, of course I'll shell out $11 for a couple of these adorable things when I stumbled upon them in Hot Topic. First up: Brienne of Tarth. I love Brienne, and although her story-line meanders a little in the books, Gwendoline Christie has done a fantastic job bringing her to life on the small screen. She's complex, endearing, and a badass. I can't wait to see what's in store for her in Season 4. But onto the toy! 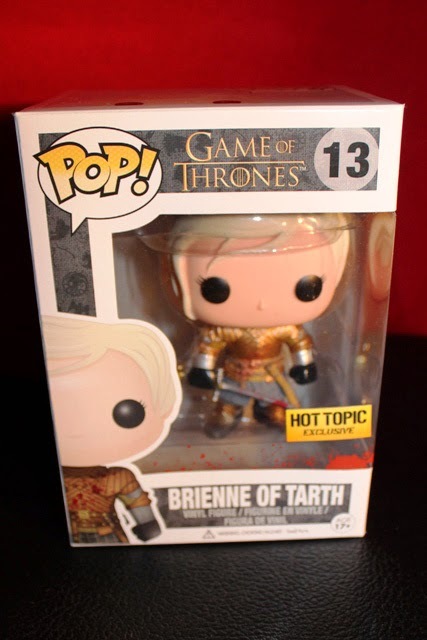 I ended up buying the Brienne of Tarth "Blood Spatter" Hot Topic Exclusive, not because I was looking for it, but because she was the only one left. I'm not disappointed. The bloody sword and armor is a nice touch (which we'll see a close-up of later). She comes in the standard Funko Pop! box, with her name, number and caricature front and centre. The back panel is only slightly different from series 2. They've added the HBO logo in the bottom corner, and instead of the usual 6 figures per series, we're given double! They've released 12 new figures this time, including Daenery's 3 dragons and direwolves Ghost and Grey Wind. I don't really have any interest in the animal figures and would rather see more of human characters, but to each their own. Maybe I'll warm up to them. I'm always surprised how a few tweaks to a basic Pop! mold can convey such a variety of characters. These figures are very stylized but don't skimp on the detail. 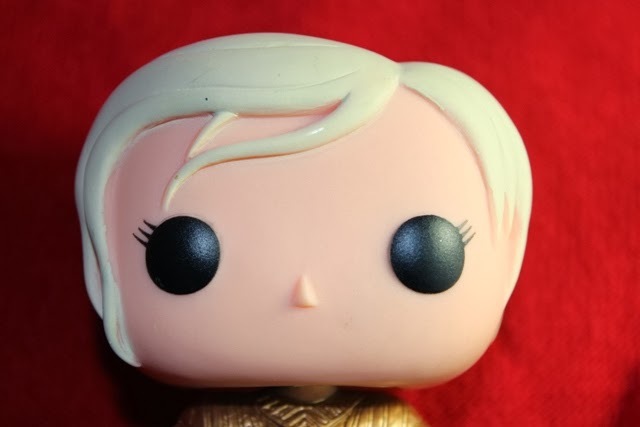 Brienne was given a short, light blonde hair with a side sweep of bangs. Like most of the female Pop! 's, She is given eyelashes that may make the face just slightly too pretty for the character. The amount of detail put into these small figures is impressive. 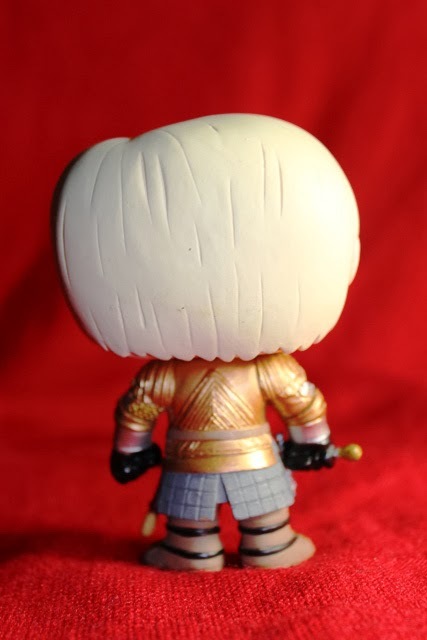 Brienne is wearing her full armor, complete with skirt and belts. There's even molded chain-mail visible under her arms and peeking from her breastplate. The design continues evenly around the entire figure (seen below). I'm really happy with the paint application on this figure. There's very little bleed and the gold, copper, an silver on the body is really effective. The skirt itself is a little boring but that's really a nitpick. The detail and patterned molding really makes her stand out. 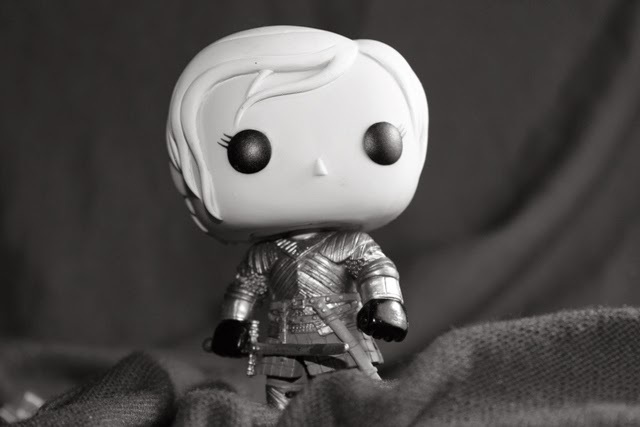 Brienne is a soldier by nature and this figure gives her a sword and sheath. Both are well painted. The rivets on the sheath and detailed handle are nice touches...but onto the blood! 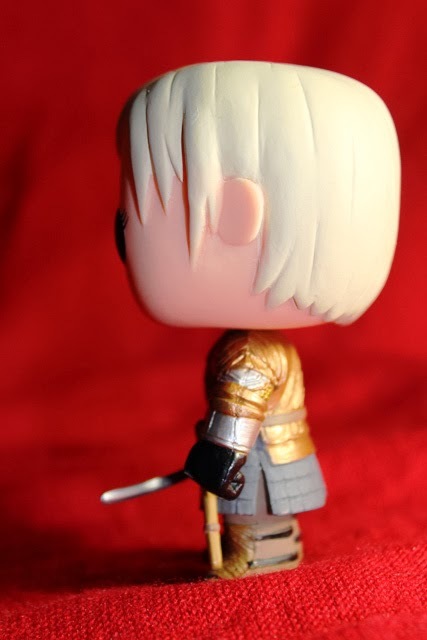 Jaime might be known as the best sword in Westeros, but Brienne gets the job done. She'll take on anyone standing in her way and has battle damage to prove it. 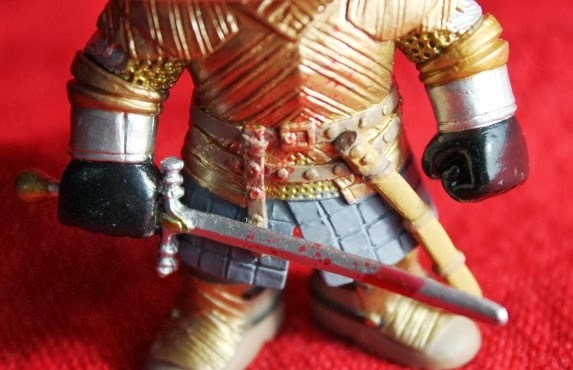 The Hot Topic exclusive is identical to the regular figure but gives Brienne's sword and armor a fresh coat of blood. The light spray runs up her chest and across the length of her blade. The red stands out great on the sword but is a bit muddy on the gold. It's a nice detail and stays true to the character, but I wouldn't pay extra to have it. Pick her up if you come across her but I wouldn't seek her out specifically. 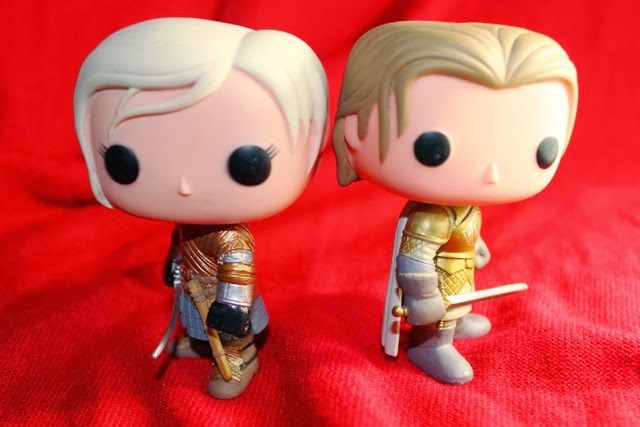 Series 3 is off to a good start, and I'm glad to have Brienne in my Funko collection. She's got all the goods. 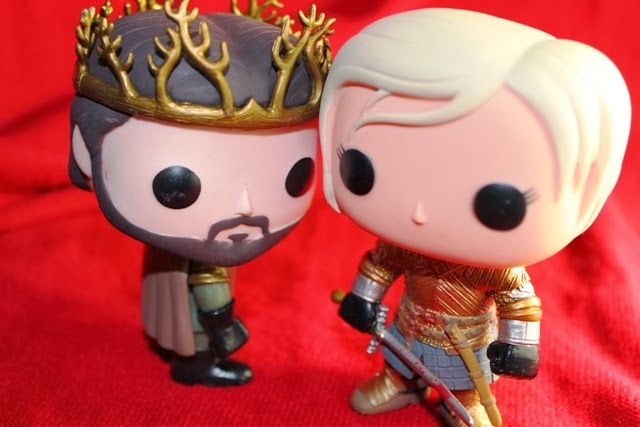 Your attention to detail about small vinyl GoT figurines makes my insides feel all warm and fuzzy... and also sad because I don't own any of them yet.... sad face. That should be remedied immediately!!! and thanks for visiting :) Up next, Loki and Heimdal minimates!